The Online Gathering Place of Baptists of all Kinds. Open discussion on general Baptist-related topics of interest to Baptists around the world. Thanks for posting that; there's a lot there for me to envy! That's an amazing collection and I now I have a larger list of hymnals I want to acquire. Rvaughn wrote: Thought I'd throw my list in the ring. I think this is fairly complete. Mostly English language (one Spanish, one partially Welsh and a couple German/Anabaptist) hymn and tune books, weighted toward shape note varieties. An Eclectic Harmony: a Collection of Four-Shape Tunes, Old and New, in a Great Variety of Styles and Meters Liz Bryant, et al. Ausbund & Lieder Sammlung Songs, with Shaped Notes Ben Troyer Jr. Original Sacred Harp, Denson Revision (1936, 1960, 1967, 1987) Paine Denson, et al. The Sacred Harp: Revised Cooper Edition 2012 W. M. Cooper, et al. The Shenandoah Harmony: a Collection of Shape-Note Tunes, Ancient and Modern, for Singing Groups large and small Myles Louis Dakan, et al. The Trumpet: the Complete Collection of Tunes from Volumes I, II, and III Will Fitzgerald, et al. Warren's Minstrel James Sullivan Warren Jr. Yes, seeing other's lists of books is always a reason to want to add to your own book collection! I also have hundreds of the little quarterly Stamps-Baxter-type convention books -- many that I inherited from my Dad and some I collected myself. So far I've not have the energy to try to enter them! I recently discovered some "Old Baptist" song books I wasn't aware of, and hope to get some of them if they are not out of print. Apparently no universities have them, at least not any whose content is on WorldCat. The first is mentioned in two places and the latter two mentioned only once (as far as I can find on the internet). Fascinating collection, but I tell you, that 1985 New Jerusalem Bible sticks out like King Solomon's sore thumb! "Midget, Broom; Helluva campaign". Political consultant, "Oh, Brother..."
Fox, I was somewhat amused when I read your story about Slapout, Alabama. So I thought I'd run small research on the Alabama "Slapout" location. From what I'm able to discern there isn't really such a place. There is a location unofficially called "Slapout," but the formal (official) name of the place is Holtville. (Source...). It's an interesting story. Oklahoma, OTOH, does have a location which is officially named "Slapout." It even has it's own zip code (73848). It's located in Beaver, County (in the extreme eastern part of the Oklahoma panhandle). Here's the Wikipedia article about the Oklahoma "Slapout." I've been through there hundreds of times through the years. As recently as 6 years ago, the population of Slapout, OK was 8. Here's a photo I took several years ago. The inset is the sign over the door of the filling station. The photo was taken from the west side looking east. Here's another photo of Slapout, OK looking west. I'm one up on Fox when it comes to stories about "Slapout" locations. 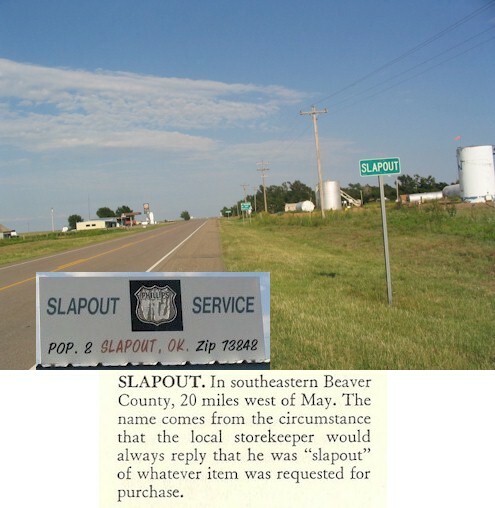 Slapout, Oklahoma is the official name of the location, whereas Slapout, Alabama is really Holtville, Alabama. With that, I'm slapout of anything else to say about locations named "Slapout." I think I've already read it but give me a link. I think the OSU game ending was a travesty...somebody oughta sue somebody over it. William Thornton wrote: I think the OSU game ending was a travesty...somebody oughta sue somebody over it. "Slapout" looks like the kind of place where after several hours of driving, the kids are fighting in the back seat and you have had enough so you are tempted to slap them and throw them out of the car. Don't despair if your job and your rewards are few, remember that the mighty oak was once a nut like you! William Thornton wrote: I think I've already read it but give me a link. Stephen, do you sing with the Iveys, and/or the Hogans from down in the county where Slapout is? Just got a copy of the North American Hymnal (German Baptist) in the mail today, amazed that I never saw this one before (in this neck of the woods there are a whole lot more Swedish Baptists than German ones). I also got a copy of Buell Cobb's The Sacred Harp: A Tradition and Its Music. Have you read Cobb, Stephen, either this one or his later Like Cords Around My Heart? And have you read Kiri Miller's Traveling Home? Haruo wrote: Just got a copy of the North American Hymnal (German Baptist) in the mail today, amazed that I never saw this one before (in this neck of the woods there are a whole lot more Swedish Baptists than German ones). Where did you order it? Hymns of Grace (not to be confused with the John MacArthur/Master's Seminary book of the same title) is an updated (2003) hymnal of the Progressive Primitive Baptists, found mostly in Georgia. I was surprised that it is in round notes rather than shape notes (but I think all these churches use pianos or organs). It is a large book -- 768 songs, responsive readings, several indices -- very nice (except for the round notes, of course!). The Mvskoke hymn books are words only hymn books, primarily in the Mvskoke language, and available from the Seminole Nation Museum in Wewoka, Oklahoma. The Old-Line Primitive Baptist Hymn and Tune Book is compiled by a Primitive Baptist and Sacred Harp singer in Wisconsin. It is very nicely done, much in the spirit and style of Durand and Lester's Primitive Baptist Hymn and Tune Book. It has about 850 hymns and around 200 tunes -- most of them of the Sacred Harp or old hymn-tune flavor. Haruo wrote: I also got a copy of Buell Cobb's The Sacred Harp: A Tradition and Its Music. Have you read Cobb, Stephen, either this one or his later Like Cords Around My Heart? And have you read Kiri Miller's Traveling Home? I know you asked this of Stephen, but I will also speak to your question about the Sacred Harp books. I have Buell Cobb's The Sacred Harp: A Tradition and Its Music. It is a great book and I think still considered the standard work on Sacred Harp history. I highly recommend it, with a few caveats. You must understand that some of the material is outdated. We have learned a lot since it was written. It focuses more on the "majority" Sacred Harp history of the James-Denson stream and only peripherally on the Cooper and J. L. White books and their contributions to the Sacred Harp and its history. I have Like Cords Around My Heart and have read portions but not all the way through. It is a different type of book than Cobb's history book -- kind of homey storytelling -- and is full of great personal stories. I own Kiri Miller's Traveling Home, but haven't read it -- main reason being I read the thesis on which it is based. Thanks, Robert. Do you know the copyright status of the Mvskoke (Muskogee, aka Creek) hymns? And can you tell if they scan well to standard hymn tunes? I'd love to include one in Sankta Harmonio! Looks like most of the hymns are arranged to suit metered tunes. You should be able to use one of those. If you scroll down to the bottom of that page you should also see a link to Dakota Odowan, an 1879 Dakota language hymn book. It has tunes as well as hymns. Yeah, I have good usable texts in Cherokee, Chinook Jargon, Dakota, and several other indigenous North American languages, but didn't have any Muskogee. Thanks. Here's a list I did today of 389 hymnals (or like items) I have (actually, a few of them are databases rather than items); one has been added since. Al Dio sonu nova kant'! Fresh Laurels for the Sabbath School, A new and extensive collection of music and hymns. Prepared expressly for the Sabbath Schools, Etc. New Perfect Praise for Sunday-Schools, Singing-Schools, Revivals, Conventions and General Use in Christian Work and Worship. Pennsylvania Christian Endeavor Songs: Sing and smile and pray "For Christ and the Church"
Richard Maxwell's Favorite "Hymns You Love"
The Silver Trumpet for Revivals, Sunday-Schools, Conventions and General Use in Religious Work and Worship. Мир вам! Peace be with you! I spend a lot of time in used bookshops. If I see something that's not on your list, I'll pick it up and send it to you. That'd be wonderful. Hymnals in foreign languages (especially ones I don't have yet, be they well-known or obscure) are especially high priorities for me. In English, something CMA would be welcome; my Vietnamese and one of my Spanish hymnals are of that fold. I'm not sure how much value a hymnal has, though I am sure that some of the rare ones are historic artifacts. I have a Song and Service Book for Ship and Field, published in 1941, and stamped with the USS ARIZONA BB-39 on front. It was my Dad's and he was at Pearl Harbor, though on December 7, 1941 he was in San Diego. I've never been able to find out anything about it. Most individual copies of older 20th-century hymnals are barely worth the shelf space; if they're in good shape there may be a church start somewhere that will take them off your hands, But obviously your dad's service book has sentimental value. But once you get back into the 1800s things become much scarcer and you can resell them on ebay or whatever for well above the cost of Media Mail. I'm interested in a wide variety of hymnals, so if it's not on my list I probably could use it.